I have redesigned my Latte Stamp Club for you! Starting January you will receive a creative package in the post each month! It will include a Stamp Set, Card Kits and Tutorials. 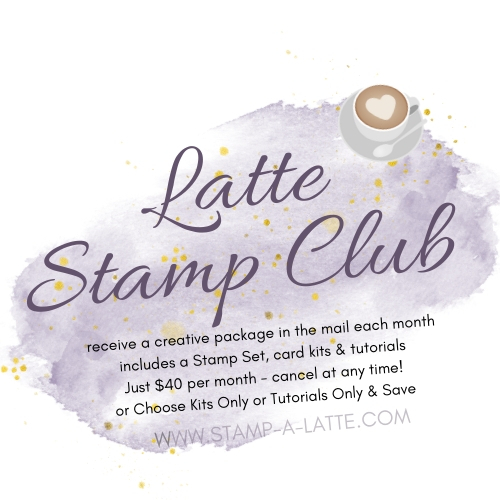 The new Latte Stamp Club is for people who want something exclusive in the mail each month and dont have time to attend classes or no where local to go to classes. It will give you something to create without the hassles of what products to choose to create with and what to make with it. You'll receive everything you need to make some sweet cards and will be designed for all levels of stamping - from beginner to totally addicted! You can subscribe using PayPal so you dont have to worry about missing out on any kits! It will go through automatically each month and your kits will be sent to you free of charge. There are three subscription options for you! Your Tutorials will include step by step instructions for each card and a list of products used to make shopping easy for you! Payment will be made via PayPal and on a monthly recurring basis. You will need to ensure you have sufficient funds in your PayPal or linked account when payment is due. Payment will be taken by PayPal on the 10th of every month to allow for the kits to be sent and received by you by end of the month. If you opt to place an order you will receive free shipping on your order being a Club Member! Sounds like a lot fun doesn’t it? The new Stamp Club starts in January so join today!